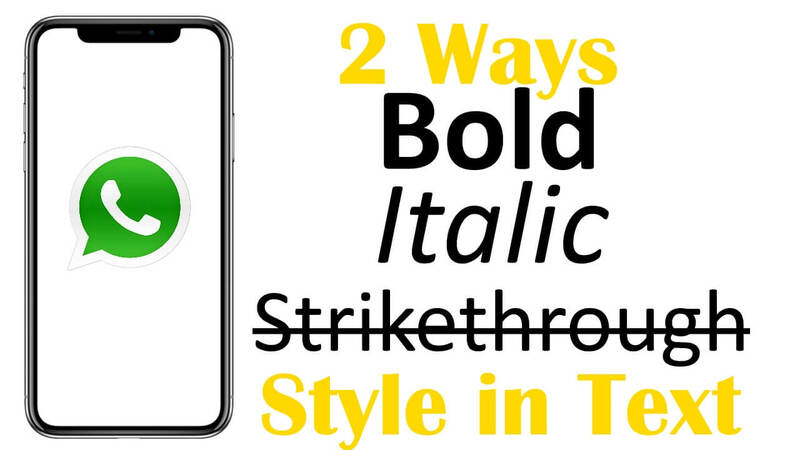 Today in this post we will show you how to type Bold, Italic, Strikethrough in WhatsApp app and WhatsApp Status on iPhone. Text formatting feature in WhatsApp brings many advantages mostly to professionals. Like if you want to promote your product, then you can Bold the product name and its cost, etc. If you want to write an eye-catching message to influence your audience, then text formatting is very useful. Moreover, WhatsApp status also supports text formatting. The procedure is almost same to type message or status in Bold or Italic or Strikethrough form. We have mentioned two ways that will help you to type Bold, Italic, Strikethrough in WhatsApp app and WhatsApp Status on iPhone. This Trick works for all iPhone models iPhone XS Max, iPhone XS, iPhone XR, iPhone X, iPhone 8, iPhone 8 Plus, iPhone 8, iPhone 7, iPhone 7 Plus, iPhone 5S, iPhone 6/6 Plus, iPhone SE. Step #1: Unlock your iPhone and launch “WhatsApp” app in it. Step #2: Open up any conversation or start a new one. Step #3: Type a message that you would like to send. Step #4: Now to bring “Select” or “Select All” options, tap and hold on the text that you have typed. Step #5: Next, tap “BIU”. Step #6: Select from Bold, Italic, Monospace or Strikethrough. Step #7: Tap on Send arrow to send the message. Likewise, if you wish to add WhatsApp status by doing text formatting, yes you can do by the same procedure. Let’s see how to type Bold, Italic, Strikethrough in WhatsApp app status. Step #2: Type Status you would like to upload. Step #3: Select the text to make it Bold, Italic, Strikethrough or Monospace. Step #4: After selecting text, tap “BIU”. That’s it! Now you can perform text formatting on WhatsApp status too.